This is the other reason why I was so tired after last weekend. After getting home really late from Rhinebeck on Saturday night, I had to wake up very early on Sunday to bake. A friend of mine commissioned me to make her a wedding cake for her wedding in November. She and her fiance were coming over on Sunday afternoon to taste the cake flavors and make a decision on what they want. Oh, didn't you know I make wedding cakes? Well, honestly I have never made one before. She called me in May and asked if I could make her wedding cake and cater her reception (for after the church) with appetizers. I was a bit shocked that she had that much faith in my baking skills. I spend Thanksgiving with her family every year ever since I moved to NY 7 years ago and I always make elaborate pies and cakes for their Thanksgiving feast. This is quite a honor for me to be asked, but I still had some trepidations and still do. Of course, I had just found out I was pregnant and didn't want to say anything until I went to the doctors to confirm that everything was okay. I agreed and was optimistic that the pregnancy wouldn't hinder me in my normal activities. Hehehe...boy was I wrong! I didn't know that I would spend the first 4 months of my pregnancy on the couch or in bed all day. A few months later, she called me after I announced my pregnancy to see if I could still help her with the wedding. I said that I could still do the cake, but there was no way I could make the appetizers and cater the reception. It would be too much work for me. The cake is going to be 3 tiered. 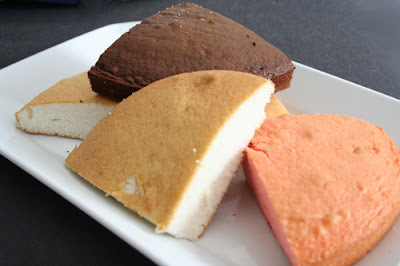 I baked 3 cake flavors: strawberry, chocolate and vanilla. I paired them up in 3 ways. They ended up choosing the vanilla and chocolate with mocha butter cream (bottom left cake slice). Stay tuned to see if I flop or succeed in a few weeks. This is going to be a fun and interesting challenge. Oh wow! I knew you baked but a wedding cake? That's a whole different level of baking. The cake pairing sounds lovely! You must share your recipe for mocha buttercream! That sounds sooooo tasty. I think I drooled on my keyboard a little. Mocha buttercream frosting...yum! good luck on the cake! you are a brave woman. Yummm, mocha buttercream! Ooh that sounds good. I'm sure you will do great, altho it would totally intimidate me. I am really not a good cake decorator. Glad you aren't doing more - it would be a killer to be on your feet that much! I'm salivating now - must have cake! I would have such a hard time choosing. Your baking skills must be good! You'll make a fabulous cake, I can't wait to see it! How special for your friend to have a cake so wrapped up with memories. It's good though that this can be done in stages so that you don't overtire yourself. Will you have anyone to help? 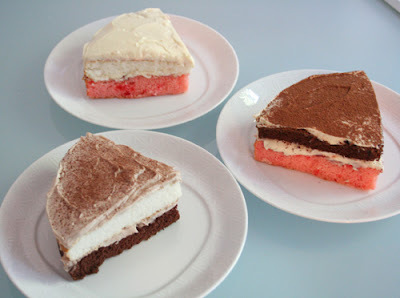 Wow, all three iterations of the cake look delicious. I'm sure the final wedding cake will turn out fabulous...can't wait to see it! These all look so yummy, I'm sure they taste even better! I'll take one of each! Your friend is lucky to have such a talented person as you working on her cake! They look amazing and a lot tastier than the usual fruit cake. Seriously hating my monitor right now. I want to just reach through it and sample some of those cakes! Yay for cake testing! (I have to do that in a few weeks, so I can work out the cake for my mother's 50th). Thanks for your comment on my blog - I think you can get back issues of that magazine though their website but they have had a few mail order issues in the past. 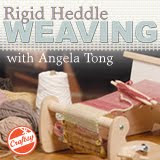 If you want the pattern and can't get hold of them, email me and I'll see what I can do.